We can arrange for your range to be connected when it is delivered by the manufacturer, provided that the electrical or gas points are already in situ and conform to current regulations. This service does not include moving of existing pipes or wires, and fees are not refundable in the event of non-connection. Should you be in any doubt it will be better (and possibly cheaper) to arrange for a local fitter who can provide a more comprehensive service. You can find one at www.gassaferegister.co.uk. Connection can only be made to a supply which is sufficient for the appliance. In all cases installation position must be approved by the engineer in situ. Adequate ventilation in the room is required. Proximity of surrounding and overhanging cupboards should be taken into consideration. Allowance should be made for suitability with regard to side walls, especially where appliances with side opening doors are to be installed. All connection points must accessible for servicing. If booked, disconnection of your old appliance will only be done provided the engineer on site agrees that your current connection accords to Gas Safe standards. It is difficult to give specific advice about positioning range cookers, as this will always vary according to the product and the manufacturer. There are some basic rules (proximity to walls and windows, positioning of switches, etc.) about which we can offer general advice, but the best way is to obtain in advance a copy of your product's manual, which you can often download from the brand's own website. Alternatively, use these phone numbers to contact the manufacturer, or just call our team for advice. Will it fit the Gap? One query we often hear concerns the gap one should leave either side of your cooker. The first thing to know is the exact size of the cooker, and these are usually 5mm or so under the nominal width, so if your space is actually 1000mm wide your 995mm range will obvously slide in nice and snugly, and this is all the space you need. Modern cookers are very well insulated so you do not need a large side-gap, unless perhaps you are positioning next to a refrigerator or wine cooler. However, some range cookers (e.g. Stoves Sterling) do need a greater gap due to other factors like handle clearance, so it is always best to check with us or the product manual to be sure. We often hear from customers who are replacing an older cooker which has a very particular width (102cm, 98cm etc) for which there is no direct modern replacement. Leaving aside the annoyance that manufacturers should build to these peculiar widths, there is no simple solution to this other than to replace with the next size down, although this will of course result in an unsightly gap either side of your cooker. These odd sizes are rare but we suggest you bear this in mind before you purchase, as although the prospect of replacement may seem distant it will happen one day, and at a point when you may not want to re-do the whole kitchen or re-size your granite worktops! If you are having to re-wire, or are installing a completely new kitchen, we do recommend that you install a 45amp cooker circuit, even if you only need a 32amp currently. This will ensure that should you or a future occupant wish to install an all-electric range (an increasingly popular format) then everything is there and ready. 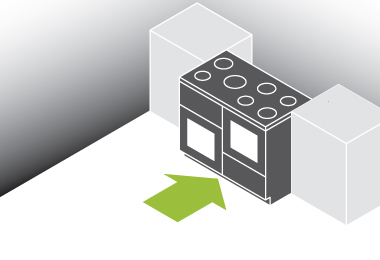 When positioning a range cooker into a corner, remember to allow enough space for the doors to fully open. Connection can only be made to a suitable gas point. This requires a bayonet fitting on a fixed pipe approximately 75cm from the ground (ensure this is securely anchored/strapped to the wall). The engineer will supply a flexible hose for connecting the range together with safety chain or stability bracket as required. If you have ordered a connection service with your range, please note that the manufacturer's engineer will NOT be able to undertake extra pipe work to meet the required standard. If in doubt, book a local Gas Safe engineer to carry out an assessment and do any necessary work prior to installation. Although bayonet fittings are temptingly simple to connect to, the risks are obvious and you should get this done by a competent or qualified person who can carry out the necessary pressure tests and deal with any leaks. 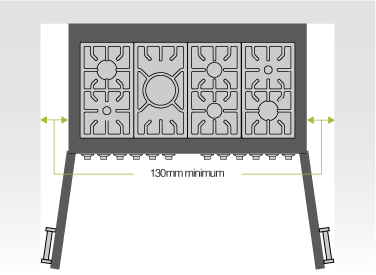 Dual Fuel Ranges - In most cases this requires connection via a 6mm heat resistant flex to a 32Amp double pole switch (consult the product manual for your cooker). The switch must be easily accessible, and all must conform to regulations or the installation may fail and no refund can be made. This high current can kill you instantly, so always consult an expert if in doubt. Gas Ranges - Usually only a suitably positioned 13 Amp electrical socket is required. A 13A plug will already be fitted to the range. A suitably powerful connection point is needed. In most cases this requires connection via a 10mm heat resistant flex to a 45Amp double pole switch, but some induction ranges may need a higher rating, as indicated on our product spec tables. The switch must be easily accessible. This high current can kill you instantly, so always consult an expert if in doubt. A flame supervision device (FSD) or flame failure device (FFD) is part of the gas burner system that detects if the flame is extinguished, and if so, cuts off the gas supply automatically. As of May 2010, all cookers with gas burners need by law to be manufactured with FSD, so any new cooker you buy should now be compliant, unless you are buying very old stock or an older display model. The regulations state that all gas cooking devices fitted in multi-dwelling buildings and flats cannot be installed unless fitted with FSD. For more information on the regulations visit www.gassaferegister.co.uk or speak to your local Gas Safe engineer. What is a FSD (flame supervision device)? FSD systems detect if the flame is extinguished and cut off the gas supply automatically. Do all cookers have FSD? If manufactured since May 2010, yes. Can my existing range cooker be upgraded? No, FSD systems can only be added as part of the factory build.